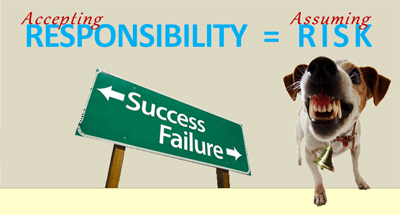 Assumption of responsibility is a double-edged sword that can give you greater power to accelerate your career or it can be used by an unscrupulous boss to cut you off at the knees. If you do not deliver the goods, you may be history or right in sync with the culture of the organization. But how do you determine which path is in your best interest? The more supportive the environment, the more responsibility you can safely assume; the less supportive the environment, the less responsibility you should assume. Regardless of the outcome, assuming responsibility means assuming risk and you need to be cautious, especially in a non-supportive environment. Do you know when you are assuming reaponsibility for a particular outcome? It may be as uneventful as saying "OK" to a comment from your boss as you pass in the hallway. Most people are not even aware of what they have done or the potential implications!